The biggest drawback for any Rifleman is his lack of ammunition. 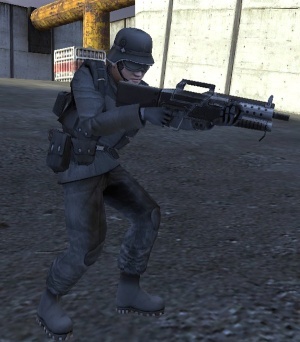 (Beta 1.03) The Assault Rifle has three clips, which means that he will be able to kill, at most, 6 people. On average, he might fire an entire clip into one opponent. This upgrade guide assumes that you will never be far from engineers or the front lines of the battle to restock ammo. If this is a problem for you, take the increased ammo skill before one of the other skills, depending on how far from your squad mates you intend to be. Furthermore, this set assumes you will be playing an infantry dominated stage of the game. Dig-in can be useful, but when it's needed, chances are there are very few infantry units threatening the Rifleman and more tanks that he will have difficulty dispatching. 'First Upgrade: Accuracy:' Rarely will you ever choose anything but accuracy as a Rifleman. 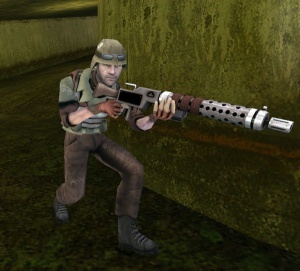 This skill makes a heavy machine gun fire like an assault rifle, and an assault rifle will now be able to out-snipe a Scout with ease. Take this skill to dominate the map. 'Second Upgrade: Increased Damage:' Although a 10% bump is a fairly small amount of damage, if you take both of the above skills, you will be able to outshoot any infantry unit on the map. Any infantry unit at all. 'Third Upgrade: Health:' This will just give you that extra edge to outlast anyone you get into a gun fight with. Note that you should NOT take health regeneration, as you'll probably be running back to healing units just to get more ammo anyway. 'Fourth Upgrade: Ammo Upgrade:' Chances are, if you're skilled enough to get the fourth upgrade, the preferred upgrade will heavily depend on your playstyle. Extra ammo is always a good choice.